The Government Accountability Office has urged the National Oceanic and Atmospheric Administration to improve efforts to track and report costs under its hydrographic survey program. 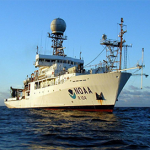 GAO said Thursday NOAA creates an annual report that compares the cost of collecting hydrographic data using agency resources to the cost of acquiring data from the private sector. NOAA gathers hydrographic data on the depth and bottom configuration of water bodies to help create nautical charts. GAO found that NOAA did not consistently provide complete or accurate cost data in its cost comparison reports from fiscal years 2006 through 2016. NOAA officials told GAO they intend to take actions to improve cost tracking but did not provide specific measures or time frames for such actions. GAO added that NOAA has yet to develop a strategy to increase private sector involvement in the hydrographic survey program as required by law. NOAA officials said the agency has adopted a centralized procurement process in an effort to increase the number of contractors from five to eight, but GAO found that NOAA did not create a strategy to expand its use of the private sector to reduce duplication. NOAA plans to establish a strategy after optimizing its approach to compare the agency’s hydrographic data collection costs to those of the private sector, GAO noted.